Submarine Manufacturing & Products Ltd continue to make their mark in the Subsea Industry. Preston-based Submarine Manufacturing & Products Ltd (SMP) are continuing to make their mark in the Subsea industry following the manufacture and supply of a bespoke air/gas diving spread unit for an international subsea service contractor. GloMar Subsea approached SMP to design, develop and manufacture a fully certified 20ft containerised recompression support chamber, alongside a 20ft all-inclusive machinery and mixed gas dive control, to support its offshore diving activities. The entire bespoke project was designed, fabricated, painted, assembled and tested by SMP's team of highly-skilled design engineers and workshop technicians. The air/gas diving spread comprised of a twin basket launch and recovery system (LARS) fitted with depth monitoring, a modified and containerised 1.8m DDC complete with skid mounted gas storage and a bespoke mixed gas dive control and machinery container. The project, from initial conception to final acceptance testing, was delivered in 120 days with a further 2 days of in-house familiarisation training for the customer prior to shipping. Ross Connolly, Sales Manager at SMP, said: "It is vitally important that we work closely with our customers at all stages from enquiry through to completion to ensure that we design and supply exactly what they need. "This concept can also be taken forward to include servicing and re-certification if required by the customer." The 1.8m ID recompression chamber was manufactured with gas storage beneath and a weather proof maintenance access hatch to ensure the cylinders can be retrieved for periodical inspection. 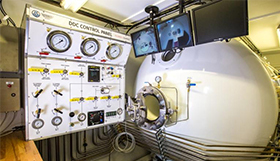 In addition, a remote control panel was installed adjacent to the chamber along with internal chamber CCTV cameras and a sophisticated decompression monitor. Complying with GloMar's requirements, the machinery area comprises of 2 x HP compressors, air storage quad and electrical distribution with vents and cooling extractor fans to expel the hot air generated by the compressors, as well as ensuring the machinery operates cool and efficiently. Mr Weitzel, GloMar Subsea General Manager, was pleased with the end result: "We are very happy with the delivery of the dive spread, we have installed it already on one of our vessels (the GLOMAR WAVE) and will start working with it in the coming weeks." The Dive Control has also been fitted with a 3 diver Mixed Gas Dive Panel as well as a full height rack with the state of the art equipment for communications, diver monitoring and CCTV. Connolly added: "As the systems are used for offshore activities, they both require a DNV container with a system conforming to IMCA Guidelines." WEC Group joined forces with SMP earlier this year as a way of combining each other's engineering expertise and strengthening operations. Please visit the SMP page to learn more about the company's services and capabilities.